It is 1840. In Louisiana, Paul Regret (Stuart Whitman) is involved in a duel with an unscrupulous opponent, whom he kills. The dead man is the son of a judge, so a warrant is issued for Regret’s arrest. He prudently leaves, and on a gambling boat meets Pilar Graile (Ina Balin), a wealthy and assertive young woman with whom he shares a night. In Galveston the next morning, however, Pilar is nowhere to be found, and Texas Ranger Jake Cutter (John Wayne) arrests him on the Louisiana warrant. As they head toward Ranger headquarters, Regret is educated about Texas, its geography and a bit of widower Cutter’s history. They come upon a ranch that has been hit by a Comanche raiding party, and as they finish burying the victims Regret bashes Cutter with a shovel and disappears. 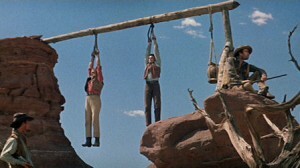 The chagrined Cutter proceeds to Ranger headquarters, where Major Henry (Bruce Cabot) shows him prisoner Ed McBain (Guinn Williams in his last film), apprehended with a wagonload of rifles he intended to sell to the Comanches. Henry persuades Cutter to take McBain’s place and head for a planned rendezvous in Sweetwater with a Comanchero connection. 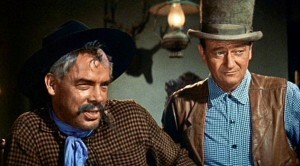 The connection in Sweetwater is Tully Crow (Lee Marvin), a partially scalped, heavy-drinking hardcase. Crow and the faux-McBain carouse noisily and drift into a poker game, where one of the players is Paul Regret. He does not give Cutter away, and during the game Cutter wins consistently and Crow gets progressively surlier. As Cutter takes up his winnings and prepares to leave, Crow calls him out and draws on him. 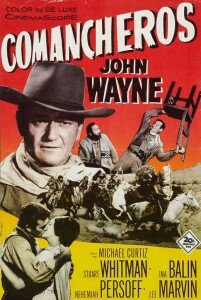 Cutter wins, but it leaves him without a Comanchero connection. 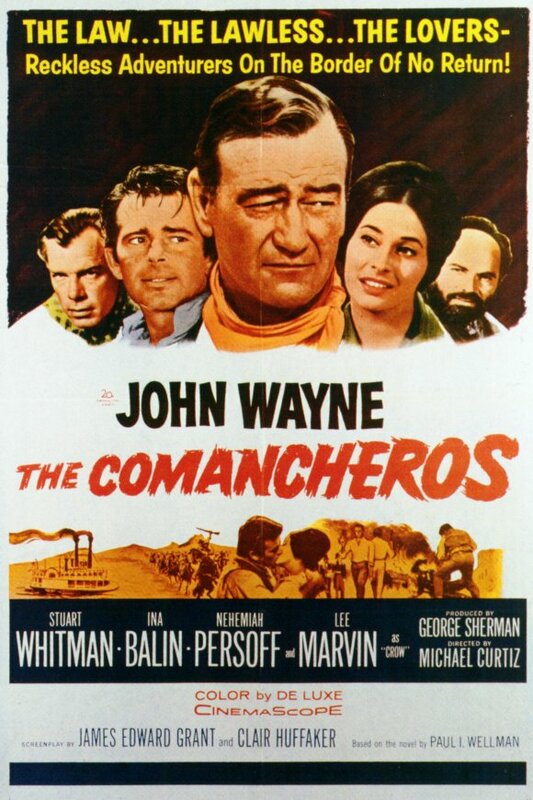 They head for Ranger headquarters, but encounter Comanche and Comanchero raiders at a ranch with Cutter friends. Regret saves the day by escaping to get the Rangers back, and the raiders are driven off. Regret is now a Ranger friend, having proved himself. On their way back to headquarters Cutter and Regret stop at the ranch of a young widow Cutter knows to take her into town. The interlude gives Cutter a little additional humanity but doesn’t really go anywhere. The Rangers provide Cutter with a feathered Indian lance that supposedly will give them safe conduct in Comanche country. They are followed by young Ranger Tobe (Patrick Wayne), who is supposed to keep an eye on them from a distance. He is killed, however, presumably to demonstrate that this is serious business despite how easily Cutter and Regret will make their own escape. They are accepted by the Comanches, who take them to Comanchero headquarters, where they are strung up because Amelung (Michael Ansara) recognizes Cutter from when he was arresting Regret. However, Pilar appears and is the daughter of the head Comanchero. She has them cut down and invited to dinner, but they are on thin ice. They meet her crippled father (Nehemiah Persoff), and it turns out that of all the forces and loyalties in play, true love is strongest (not all that convincingly). 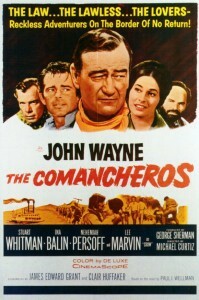 They make a run for it in a wagon with Pilar and her father, with both Comanches and Comancheros in hot pursuit. The wagon overturns in the chase, Pilar’s father is killed, and the Ranger company arrives just in time to rescue them. At the end Cutter willingly gives up his prisoner and Regret and Pilar head for Mexico. The Comanchero ring has been broken. Based on a novel by Paul Wellman, the screenplay was originally penned by experienced writer Clair Huffaker. But the studio ordered it worked over by James Edward Grant, a favorite of Wayne’s, and the seams show. They may both have been good writers, but at several points the plot doesn’t seem to make a lot of sense, beginning with Regret’s arrest. 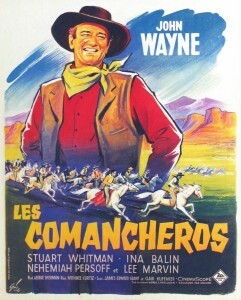 The original director was Michael Curtiz, but he had health problems and the movie was finished with the uncredited Wayne acting as director. Curtiz died of cancer shortly after the film was finished. 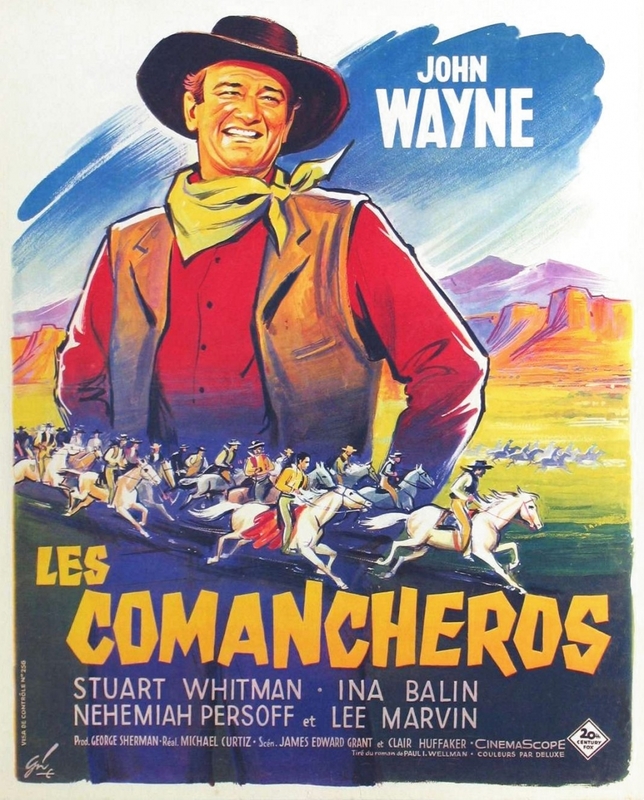 In terms of production design, although the film is set in Texas in 1840, it looks the same as every other John Wayne movie after The Searchers, whether set in 1840, 1898 or 1909, with anachronistic weapons and clothing. Some of the references to Fort Sill and the prison at Yuma are off, since neither existed until at least twenty years later. When Cutter steps into the McBain role, he wears a tall hat and long duster for no good reason, and they look silly on him. Lee Marvin’s energetic malevolence as Tully Crow is more threatening than all the Comanches and Comancheros in the rest of the movie, but his role is much too brief. Three years later Stuart Whitman starred in Rio Conchos, also written by Clair Huffaker, which has many similarities to the plot here but is a better movie. By setting it after the Civil War, some of the anachronisms of this movie are avoided. 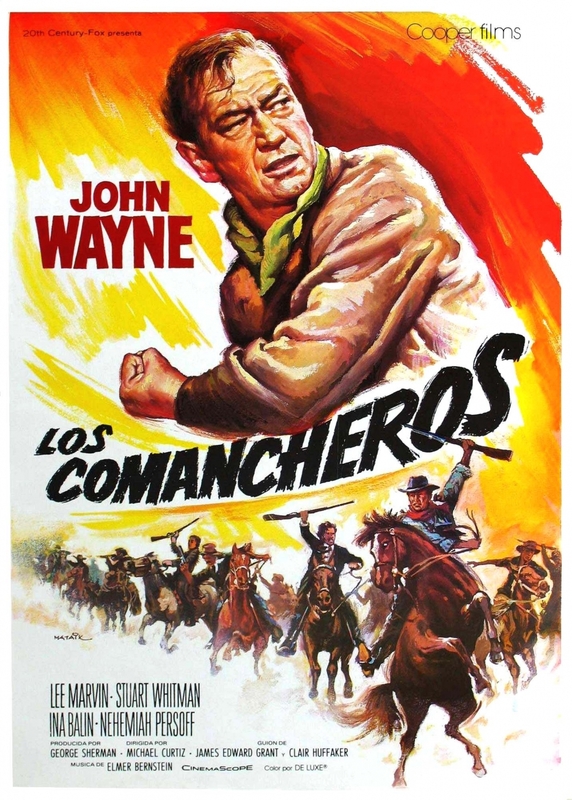 Among John Wayne films of this period, Rio Bravo, The Horse Soldiers, El Dorado, The War Wagon and True Grit are all better. But several others are worse, too. This entry was posted in Westerns Worth Watching and tagged John Wayne, Lee Marvin, Michael Curtiz, Native Americans (Indians), Selling Guns to the Indians on February 4, 2014 by Nicholas Chennault.